One of the best things that came out of Japan would be their version of noodles. I mean, they have different soup/broth based dishes that compliments their noodles. They even have a lot of types of noodles. Some are soba, some are curvy while others are just big. Big like udons. This thick wheat flour noodle is usually served with a simple yet filling broth. During my visit to Los Angeles, I was brought to one exceptionally good udon restaurant. ENTER MARUGAME MONZO. 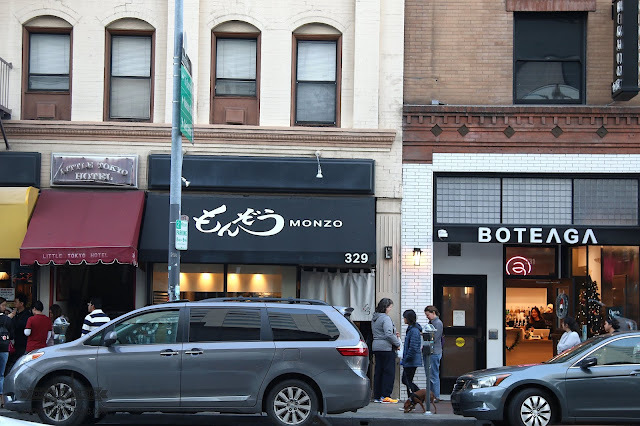 MARUGAME MONZO is located in LITTLE TOKYO in downtown Los Angeles, California. When my family and I arrived, my uncle led us to this restaurant. There, we lined up for almost 45 minutes and saw how the line would go all the way past the building. This was a pretty good restaurant, I told myself. Seeing people queue for some food makes my tummy excited. After getting in, we knew what to order. 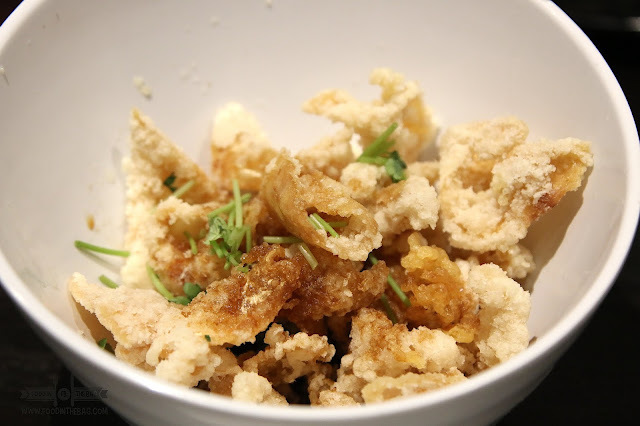 We started with some crispy chicken skin together with some beer. It was also pretty much exciting for me to use what little Japanese words I knew since the staff were Japanese. Thankfully, this wasn't like the other places I frequent that only specializes in one thing. 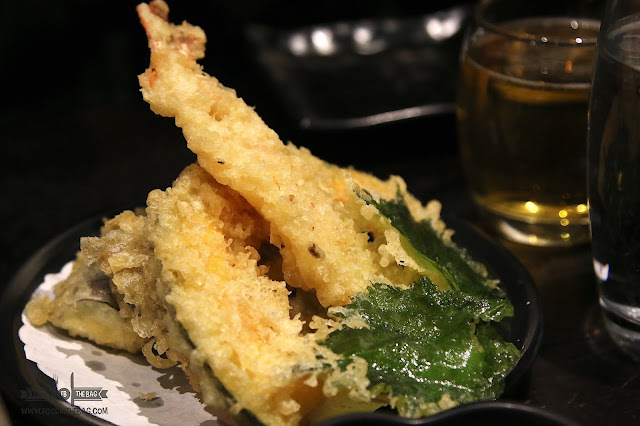 Although when you look at the menu, they all point out to their udon varieties, MARUGAME MONZO also offers other Japanese Treats like TEMPURA. 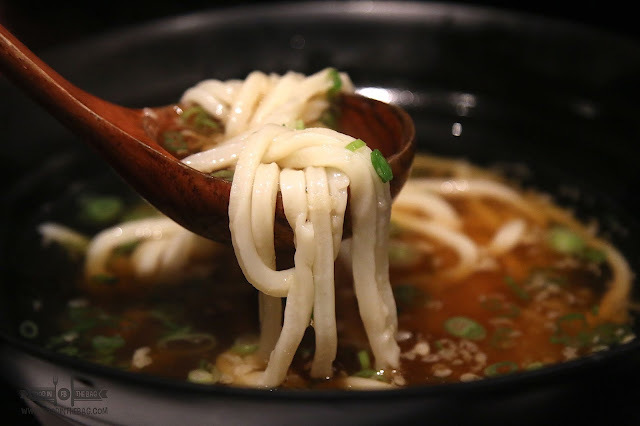 If you're not up to stirring things up, you might want to go for the traditional UDON. Served with clear broth, the noodles were pretty good and the soup flavorful and filled with umami. Not too soft, I realized why. It's because they make them in house and cook it only when you order. You also get to see a staff member kneading and creating noodles through a glass window. The noodles are all handmade. 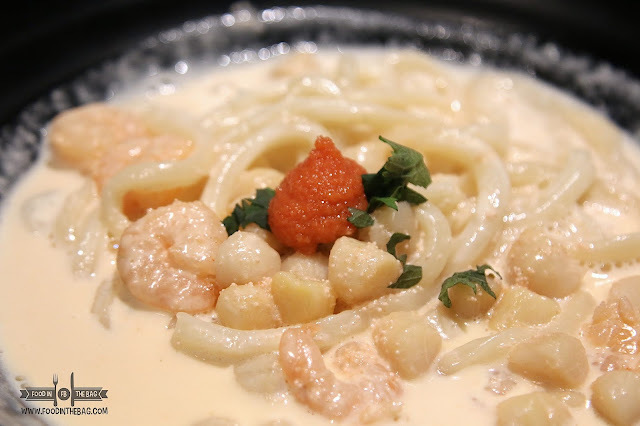 If you're more adventurous, MARUGAME MONZO has some other not so traditional udon dishes for you to try. If you're not up to the idea of something eastern, you might want to try out their MISO CARBONARA UDON. 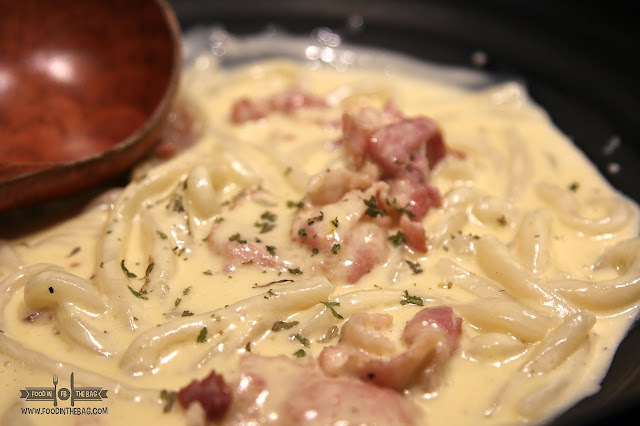 It's similar to the white sauce dish but it's noodles are chewy and big. Because of the udon, you get to enjoy a different mouthfeel with each bite. 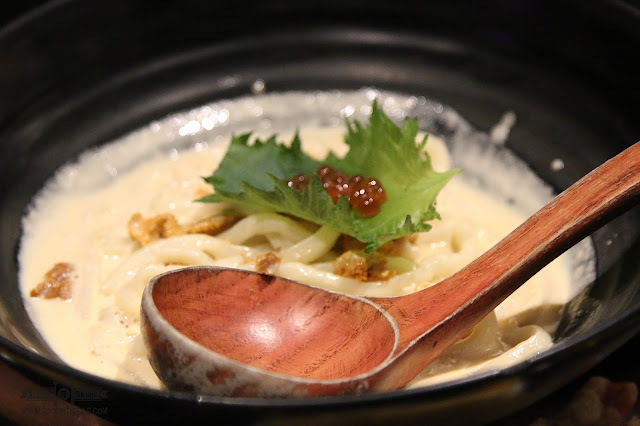 If I were to pick only two dishes to try (and I'm saying it with a BIG IF), it would be the SEA URCHIN UDON and the MENTAI CREAM UDON. The sea urchin was filled with the flavors you might expect from uni. It's extremely creamy and smooth. On the other hand, MENTAI or pollock roe brings back good memories of when I visited Fukuoka. Mentaiko is a specialty of Fukuoka and this one delivers. 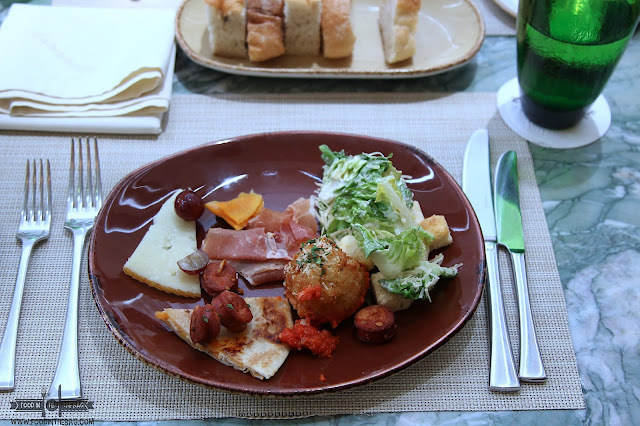 Together with other seafood bits, it makes you want to eat more even after finishing the bowl. When you visit MARUGAME MONZO in LOS ANGELES, be ready to queue up and wait. It's worth it. Also, you won't be seated if your group is not complete. There's no reservation as well. 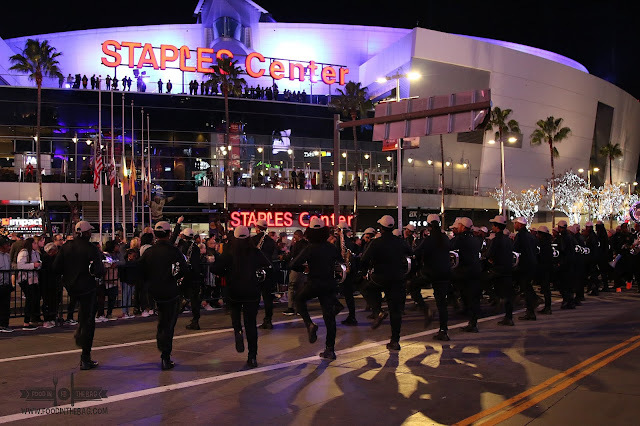 BY the way, MARUGAME MONZO is quite near the STAPLES CENTER. Probably a 15 minute drive, you could have an early dinner before heading out to this entertainment center to enjoy a Lakers game. Disclaimer:wrote this based on my experience and opinions. Paid for our meals.